The reason I read this book was that short story- Valkyrie Symptoms, which came out a couple of days ago. It’s in Tucker’s POV and it was so sweet. I liked the banter he shared with Ellie, kid sister of his best friend, Graham. Tucker is afraid to act on his feelings towards Ellie because he thinks her brother will not approve and doesn’t want to lose their friendship. This short story is set a couple of days before Valkyrie Rising begins. It was a great introduction for the series and the only thing I didn’t like is that it was too short. 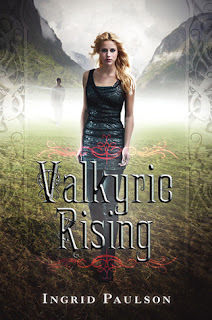 Valkyrie Rising starts with Ellie travelling to Norway, to visit her grandmother. After she gets there people start acting strange and they claim her grandma is a witch. A lot of young boys disappeared and people think she is responsible even though all grandma did was help out. But not all think that way. Ellie meets Kjell, a local boy who is drawn to her and they hit it off. But soon her brother and Tuck appear so we get to see Ellie interact with her brother and also Tucker teasing her. Everything doesn’t go so smoothly and her brother disappears along with Kjell and grandma so Ellie begins the search with a little help from Tucker. She also discovers she is Valkyrie. That is a mythical creature from the Norse mythology. They lead dead warriors to Valhalla. The problem is that those missing boys aren’t dead, which is a big no-no according to Loki, who also graces us with his presence. The first part of the book was more enjoyable, middle was messy and the ending was satisfying. The reason I didn’t like the middle is that two teenagers were up against ancient mythical creatures and the managed to stay alive without any help from adult, if you don’t count Loki, who didn’t really help at all. He was observing, not willing to get his hands dirty. I am well aware the fact this is a story for teens but I don’t get why didn’t we hear from Ellie & Graham’s mum at all? She just ships her kids to a different continent and doesn’t bother to call them? Then grandma disappears. Sure, teens are going to save, not just the town but the world all alone. Am I the only one who notices how unrealistic and messed up this is? It could have a sequel but at the same time I feel it did solve all problems so it could work as a standalone. But if it gets a sequel, I’ll read it.